Why Choose Ansbell 9 IN 1 USB CHUB? Maximum data transfer rate 5 Gbps.You can upload and download videos and other files in short time. Support HD video resolutions up to 4K @ 30Hz;Please ensure you have plug in power supply cable to get HDMI output work properly.Enjoy high-definition displays and movies in your work and life. Easily connect to the internet by connecting an Ethernet cable from the Adapter to your router. Support micro SD/SDHC card.NOTE: SD card slot and the TF card slot can be used at the same time. [9 In 1 USB C HUB Expansion ] 3xUSB 3.0 Ports,2 x HDMI 4K@30Hz, 1x RJ45 1000M Ethernet port, 1xSDHC, 1xMicro SDHC, 1xUSB-C female port for charging, you can upload and download videos and other files very quickly.And our 9 in 1 type c adapter can connect to hard disk,keyboard, mouse, headset and so on. [4K HDMI Adapter]:2x 4K HDMI ports support up to 4K @ 30Hz,connect an HDMI cable from the pro hub adapter to your external monitor to view crystal-clear display.Enjoy high-definition displays and movies in your work and life. [Fashion Design & Slim]:Using mainstream color aluminum enclosure,intimate dimension design brings you convenient,you can carry it to anywhere you go. 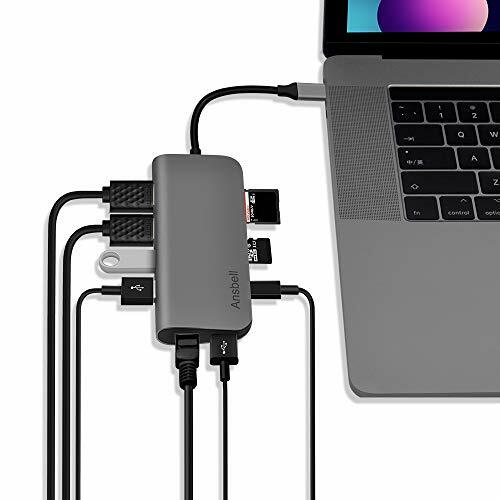 [Applicable devices:] It does not require any software,our 9 in 1 Type-C USB Hub have perfect companion for your MacBook/MacBook Pro and other compatible USB Type-C devices. [Warranty Service:] Our 9 in 1 USB C Adapters are high quality. Please do not worry when you have questions or unsatisfied of your order,because we can guarantee 12 months money back and quality warranty. If you have any questions about this product by Ansbell, contact us by completing and submitting the form below. If you are looking for a specif part number, please include it with your message.